Control panel integrated directly in the machine body, to maximize ease of use. A new design handle enhances portability, integrated directly into the product body. The new lateral tank adds to the benefits. Thanks to its internal technological upgrade, the new DEX series sets a new landmark in terms of energy efficiency, while further reducing noise levels. Suitable for room size 55m². 12 L moisture extracted per day. Size H50, W33.5, D22cm.Welcome to EditPad.org - your online plain text editor. Enter or paste your text here. To download and save it, click on the button below. 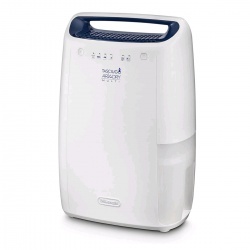 The Excellent Dimplex DXDH16BK Dehumidifier extracts up to 16 litres / 24 hrs, with a 2.3 litre holding tank, it is suitable for a 3 bedroom home or small office environment, very effective at removing moisture.